Hi! I’m Mike. I’m a geek. I started The Geek Pub back in 2008 as an outlet for my projects and interests. In the beginning it was just a place for me to post things I was interested in or something about the latest beer I was trying. I found myself posting how-to articles, mostly about computer technology because that’s what my primary job is. After a while I came to realize what I needed was something to do as an outlet that wasn’t related to work. That’s when The Geek Pub as you know it today was born. I started creating YouTube videos about my projects at home and the rest is history. You can of course find me on all the social networks at the links at bottom of the page. Be sure to follow me on Facebook! To learn a little bit more about me, you can also watch my video”All About Mike“. Or for more about The Geek Pub, watch my Channel Trailer on YouTube. I have a question about your Arcades! You should be reading the Arcade FAQ page! 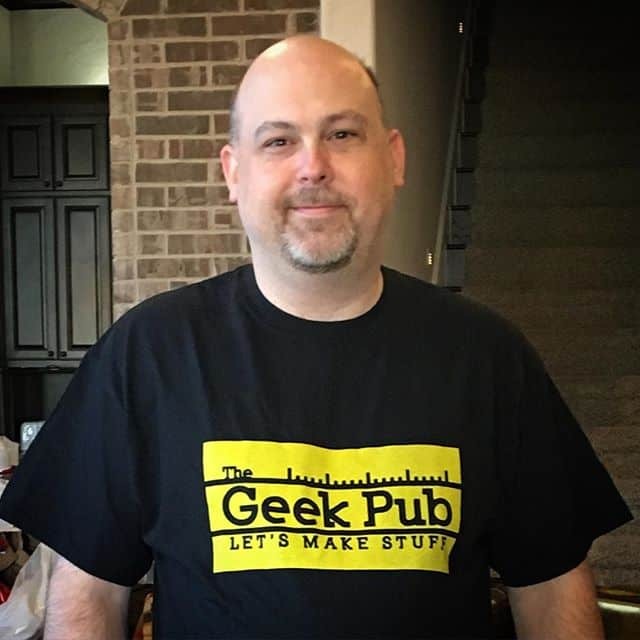 My email is mike@thegeekpub.com or you can use my contact form. Will you make a _______________? Maybe. If it fits within the theme of my channel, its somewhat affordable, and I generally like the idea I might make it. I’m constantly asked in the comments on YouTube to make XYZ item, which I’ve already made and have a video about though. I’ve also been asked many times to make someone a project in my videos for them to purchase. I don’t have time unfortunately to make custom projects. I do love hearing your project ideas though, so be sure to send me an email, or drop me a line on social media. Is The Geek Pub your Full-Time Job? Nope. I have a full-time job that I go to everyday. Tech stuff. I also have a wonderful wife and family who take up a lot of my time. The Geek Pub is something I do as a hobby and a creative outlet. I like to be busy. You said you were in Tech, what do you do? I like to keep work and personal separate, but think big rooms full of computer servers. Why aren’t all of your plans free? I spend a lot of time designing and creating my projects. Some of them take me hours, or days to design. I feel like I deserve some compensation for that effort. In addition, The Geek Pub has a lot of bills every month. From hosting bills to the cost of the materials used in the videos. The small amount I make off of plans helps with these overheads. How did you get Started in Making/Woodworking? When I was a youngster my grandfather was a retiree and had a wood shop in his backyard. I would play in his shop with him making simple things some weekends. I always enjoyed that. When I got older I took some shop classes in high school. It wasn’t until I was in my twenties that I really got into making stuff, mostly for cars and trucks (boom boxes, custom dashes, etc). When I got into my thirties I started collecting tools and recently in my forties I built a new house with a dedicated work shop area. Maybe. Contact me and we’ll see if there is a fit. It might help if you live in North Texas. Can my company be a sponsor of The Geek Pub? Maybe. I do accept some sponsors, but since this is hobby I am pretty picky about my brand image. Send me an email and we’ll see if there is a fit. Win-win scenarios are always best. I’ll never tell, and North Texas. Do you know David from The 8-Bit Guy, you look alike? I’m offended that you think I look anything like my brother. For those of you who don’t know, his channel is The 8-Bit Guy on YouTube. We’re 3 years apart in age. I’m older (and better looking). Do you have a Shop Tour? What about your pets, favorite food, etc? I made a video all about that stuff a while back. I don’t want to watch the video.. Tell me about your pets! I have a 7 year old pug named Ellie and a 6 year old tabby cat named Lilly. I don’t want to watch the video.. Tell me about your favorite foods! You really are impatient. I’m probably the least picky eater you have ever found. I love all food. But my favorite is Mexican food. Really just about anything Mexican gets me excited. But I also love Sushi, Italian, and American foods like burgers. About the only foods that make me awkward would be be beets. And even beets I can eat under the right circumstances. As for drinks, I love beer and wine, and pretty much all mixed drinks. My current favorite beers are Blue Moon and Shock-Top. My favorite wine is Kendall Jackson Chardonnay and Toasted Head Chardonnay. Honestly though, I’ve never met an alcohol I didn’t like. That video is way out of date! Make a new one! Tell me about it. I wish I had more time. What drone are you flying in your videos? I currently fly a Phantom 3 Professional from DJI. It’s capable of 4K video, but I generally publish in 1080p because it gives me the ability to digital zoom without loss of quality. Would you be willing to talk to me about data center security? Probably not, but I wrote an article about data center security. It specifically has to do with drones, but its good info for anyone who runs a data center. Your house is awesome! Who built it? Brian Demma, owner of Polaris Custom Homes.